The Clock Constraint Specification Language (CCSL), first introduced as a companion language for Modeling and Analysis of Real-Time and Embedded systems (MARTE), has now evolved beyond the time specification of MARTE, and has become a full-fledged domain specific modeling language widely used in many domains. A CCSL specification is a set of constraints, which symbolically represents a set of valid clock schedules, where a schedule represents the order of the actions in a system. 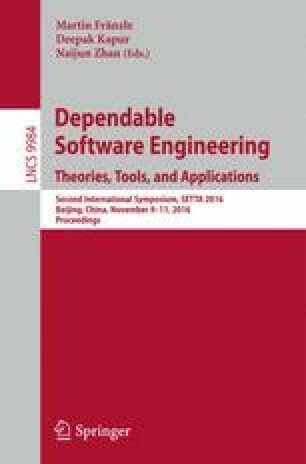 This paper proposes an algorithm to detect the divergence behavior in the schedules that satisfy a given CCSL specification (i.e. it proposes to detect the presence of infinite but non periodic schedules in a CCSL specification). We investigate the divergence by constructing causality chains among the clocks resulting from the constraints of the specification. Depending on cycles in the causality chains, a bounded clock set built by our proposed algorithm can be used to decide whether the given specification is divergence-freedom or not. The approach is illustrated on one example for architecture-driven analysis. This work is supported by the Natural Science Foundation of China (Grant No. 61572306, 61502294).